I'm paying homage to the work of one Michael Thibodeaux. Who writes, as well as Inks and draws his own comics. 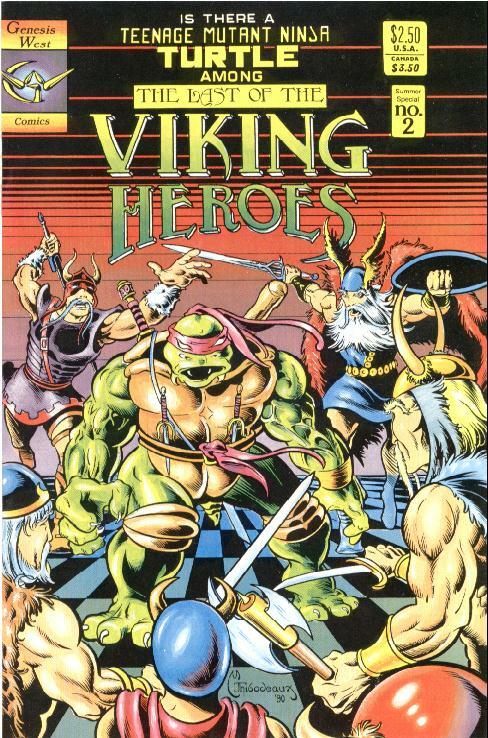 As this was a time when those Eastman and Laird comics were also doing the rounds as along with all the other hype surrounding the 'Teenage Mutant Ninja Turtles' movie. Iwas intrigued enough to purchase this. Volume two, a summer speical. From what I could tell of reading just this one comic it. It's just the one of many tales of these Midgard warriors, with a supposedly false wizard and his physically adept barbarian ally ( Who is probably based on Conan.) thrown into the mix. While drawing and colouring style isn't that advanced and complex by today's standards. I still think it stands up. The way it's all put together is very charming and a pleasure to read/look at the pictures again as I have been sorting through all my old and new comics these last two days. I'm just sorry I didn't buy more of these when they were in circulation. Though they may have a whole set of these in old comics section of the very same store where I brought it brand new in the first place.